Should you ever happen to be visiting Bologna, you would be facing the issue of finding a good restaurant in the area. 'Cucina Emiliana', the local cuisine, is very popular across Italy with dishes such as tagliatelle, tortellini, lasagne alla bolognese. You can find these pretty much everywhere, but most likely you would end up in some touristy sort of restaurant where you are going to be served very average, disappointing food. If you are up for something more special and adequate for a gurmet palate, I would like to recommend this restaurant which I had the pleasure of visiting during my last trip to Bologna. 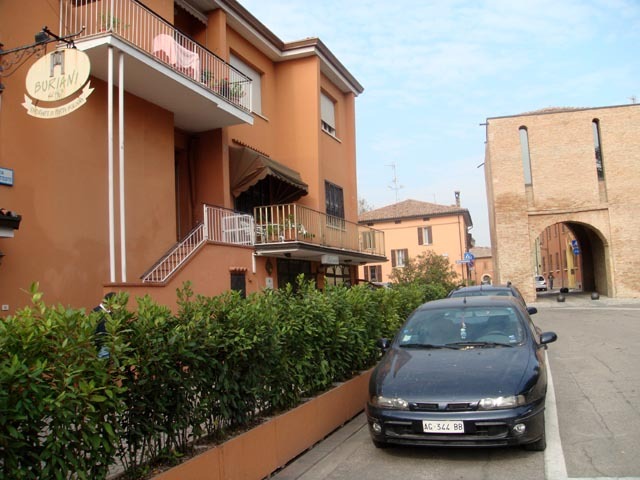 Ristorante Burani is not located in the city centre, and you need a car to get to the place. The location is Pieve di Cento, about 40 minutes drive from the city centre. This restaurant has been awarded "1 fork" (on a scale of 1 to 3) by "gambero rosso", which is a very significant award within the Italian culinary scene. 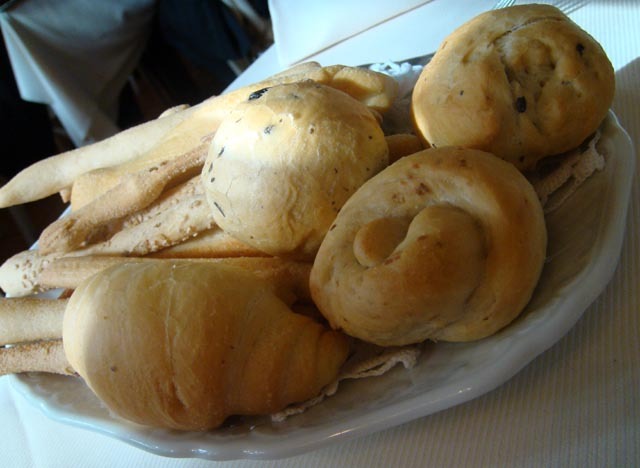 As in any respectable Italian restaurant, you will be served a selection of bread specially prepared by the chef. The bread was of good quality, although not absolutely the best. 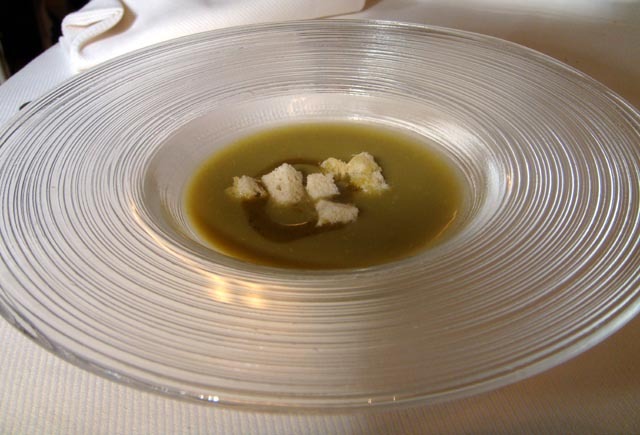 This 'zuppa di carciofi con crostini' (artichokes soup with crostini) was served for 'free'. 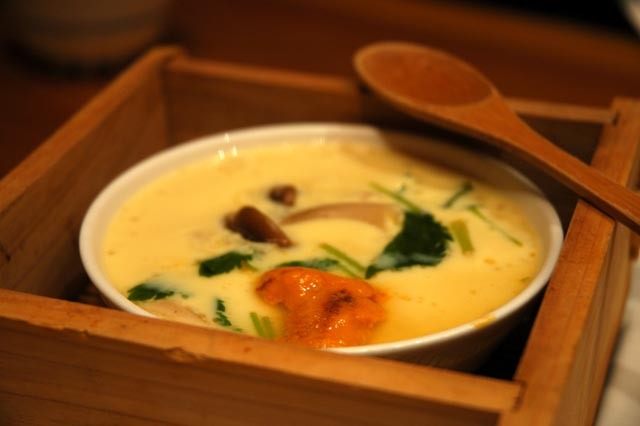 Although I am not a big fan of artichokes, I could enjoy this thick soup because of its mild flavour. The bits of crunchy bread could either be enjoyed with their crispness or soaked into the soup. 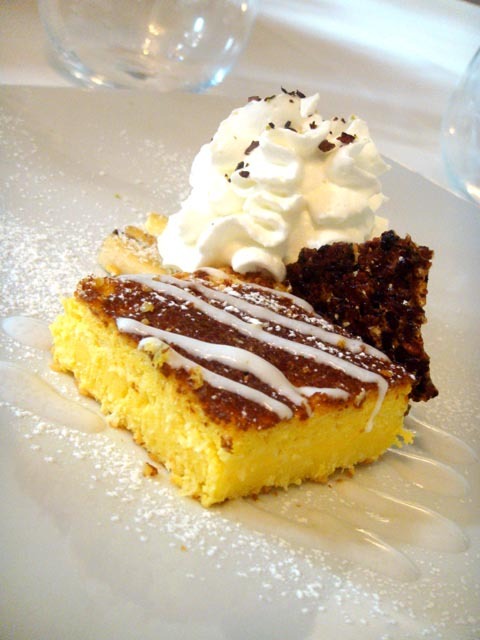 The 'flan di polenta in zuppetta di squacquerone con porcini arrostiti' was a slightly experimental version of a very traditional combination. 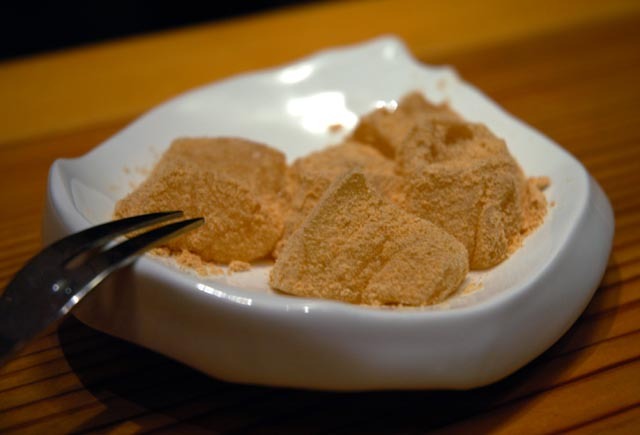 The polenta was a lighter and fluffier version of the real thing (a pudding made from cornflour). 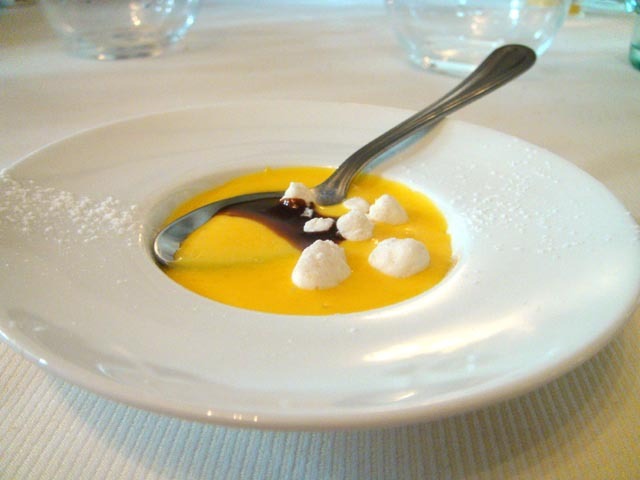 Squacquerone is a typical local fresh cheese, which was filtered into a thick soup to create an appetizing base for the polenta. 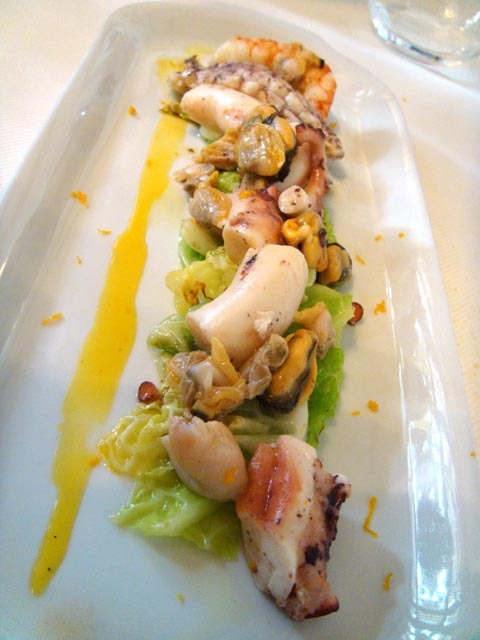 As a starter, I ordered the 'Insalata di mare tiepida con verza e profumo d'arancia' (tepid seafood salad with cabbage and orange scent) which was better than I anticipated. 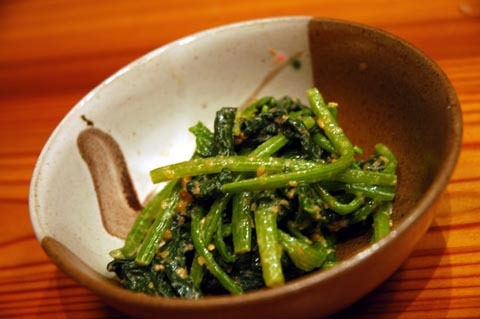 The delicate flavour of a tepid melange of seafood was enhanced by underlying leaves of savoury cabbage. A lot of attention was put in the way the cabbage was seasoned, most likely with some fish/seafood stock. 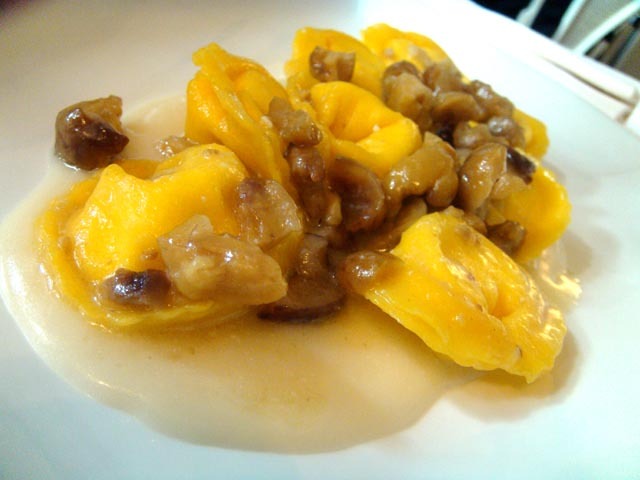 A well balanced orange zest tang added a kick to an otherwise fairly standard dish. As a first course, my friend ordered the 'tortelli di ricotta e scalogni con castagne e fonduta di pecorino' (tortelli with ricotta and spring onions with chestnuts and melted pecorino cheese). Unfortunately these disappeared from his plate so quickly that I didn't get a chance to taste them. I won't be able to provide a detailed description, but he looked very pleased with them. 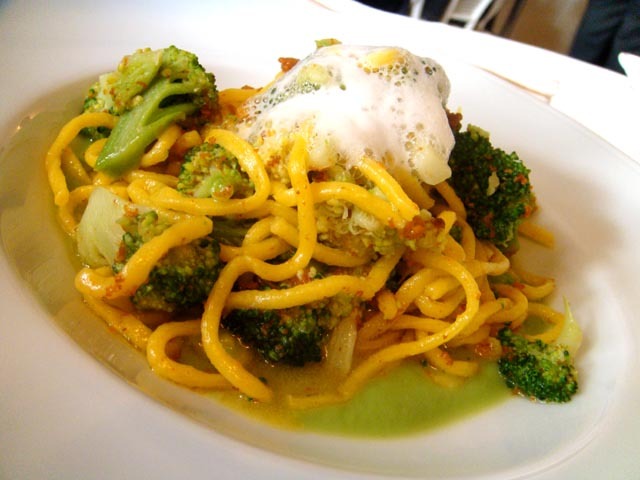 I had the 'spaghetti freschi ai ricci di mare con broccoli, schiuma d'aglio e peperoncino' (homemade spaghetti with sea urchins and broccoli, garlic foam and chilly). Needless to say, this was the highlight for me as I always tend to prefer pasta and I love sea urchins. I enjoyed the irregular texture of these handmade spaghetti, which enabled them to absorb the 'sea flavour' released by the sea urchin roe. The 'spiedo di calamari e scampi gratinati al rosmarino con zuppa tiepida di fagioli' (squid and scampi skewer with rosemary gratin and tepid bean soup) was grotesquely presented, but I interpreted it as a touch of humour from the chef. 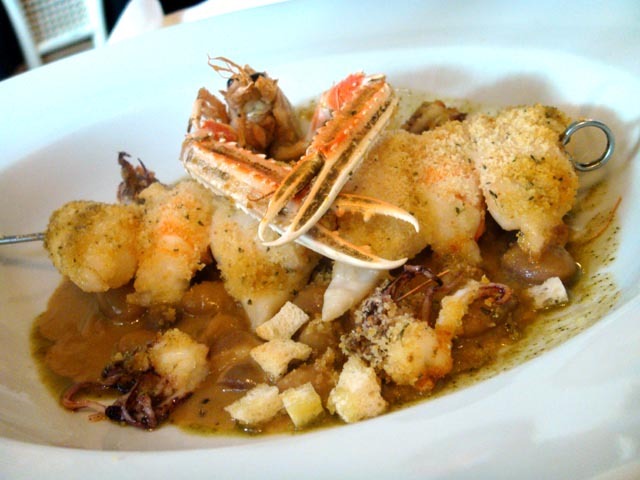 Extremely soft scampi and squid were covered by a rosemary flavoured crunchy breadcrumb layer. Crusty bits of bread with beans are a very typical Italian 'home cooking' combination, but not usually presented with seafood. 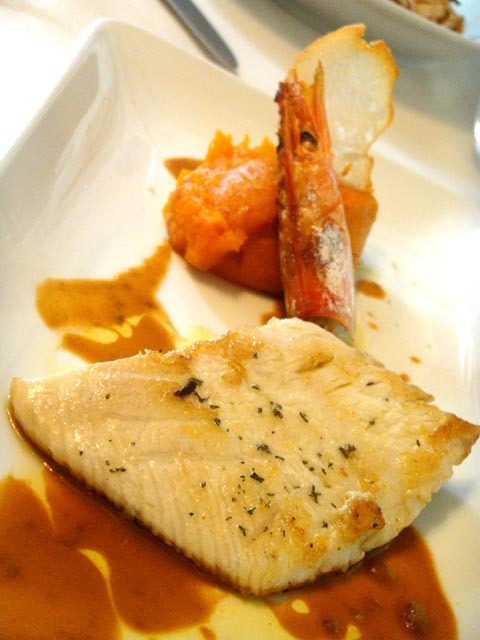 The 'filetto di ricciola scottata con zucca al sale affumicato e olio ai crostacei' (amber jack fillet with pumpkin seasoned with smoked salt and crustacean flavoured oil) was a nice creation, fresh and well cooked. I wasn't incredibly excited by this dish as it wasn't particularly innovative except for the pumpkin mash, the sweetness of which wasn't the best match with the ddelicate flavour of the fish fillet. This 'zabaglione al mascarpone' was on the house to close the meal. A very small portion (but you wouldn't want it any larger) of egg yolks and mascarpone topped by a few bits of meringue hiding a pool of chocolate sauce. This is the perfect dessert for those who feel too full after a full meal and yet wish to close it with a sweet bite. The 'coconut cake with banana and lime sorbet' was a great finale. In particular I liked the crispy and bitter layer of caramelized chocolate and coffee, which balances the sweetness of this rich dessert. We ended up spending 120 Euros ($240 SGD) for two people, which is very reasonable for a restaurant of this calibre. Although it's not centrally located, any Italian food lover would not be disappointed with the quality of Buriani's food and service. This is another one of my mother's dishes, but also an Italian classic. In English it translates to grilled peppers and aubergines. It's an extremely light and healthy vegetarian starter that can be eaten at the beginning of the meal and it's particularly ideal if you have a few guests. You can serve it on a platter, or arrange the prepared vegertables on top of warm slices of bread before serving. Start from slicing an aubergine into large 1/2 cm slices. Long aubergines are OK, but if you can find big, round ones that's even better. Consider that once cooked, aubergines shrink 2 to 3 times in size when calculating the required amount. Next, prepare a mixture of extra virgin olive oil, salt, crushed coriander seeds, pepper, dried oregano and salt. Stir well and let the spices blend into the oil. Brush the mixture onto the slices of aubergines on both sides and put them aside. Heat a large hot plate and put the aubergine slices on it one by one. Turn them over when golden brown, and repeat the procedure until all the aubergines are cooked. As you cook the aubergines, lay them on a large serving plate. In the meantime, put 3 large red peppers into an oven heated up at 190C. Leave them into the oven until the skin is quite burnt. Turn them over a couple of times. Once the skin is uniformly burnt around the whole surface, remove them from the oven and place them into a large paper bag. Seal the bag and let the peppers rest for 10-15 minutes. This will make it easier to remove the skin later. Slowly peel off the skin from each pepper. Remove the seeds, lay them flat and slice them lengthwise into 1-2cm wide slices. Arrange each slice onto the same serving plate. Once both aubergines and peppers are prepared, slice a few cloves of garlic lengthwise, and sprinkle them on top (and inbetween) the vegetables, together with a pinch of salt and a few leaves of fresh basil. Let the vegetables rest for some time to absorb the flavours, after pouring some extra virgin olive oil directly on top. After about 15-20 minutes, the aubergines and peppers are ready to be served. They can be eaten as they are or together with some warm Italian bread. During this 2 weeks stay in London, I had to visit this restaurant which used to be my favourite right before I moved to Singapore. At that time, 2 and 1/2 years back, the restaurant had just opened. They created the most elegant Italian recipes at a very affordable price. I was a regular until I left. Unfortunately the restaurant is now under new management and the Chef (who was a co-owner) has also left. However my experience was still very positive and although I can't judge their consistency from just one visit, my 'culinary sixth sense' tells me that this is still a very good restaurant. They offer a fixed price menu with 2, 3 or 4 courses respectively priced at £22.50, £27.50 and £32.50, with a 12.5% added service charge. Bread is served with the meal, and the basket includes a variety of focaccia with plum tomatoes, 'pane Carasau' (original from Sardinia), Ciabatta and other Italian classics. The extra vergin olive oil that accompanies the bread is top quality. As a starter, I chose a 'Culatello con rucola e parmigiano'. 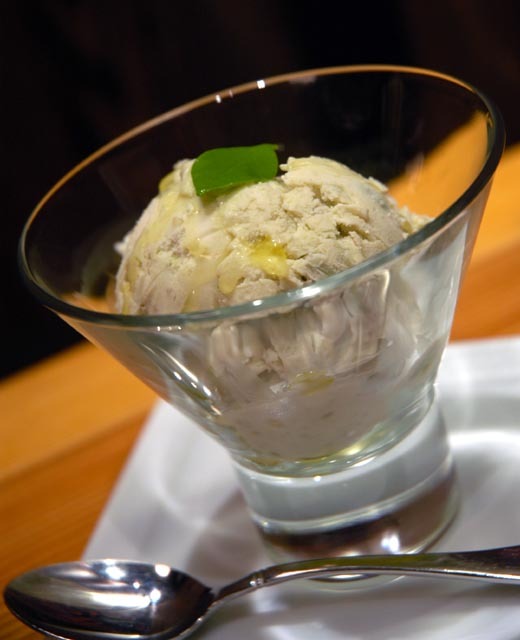 This is a kind of raw ham simply accompanied by wild rocket and thin layers of Parmesan cheese. A simple Italian winning combination of great quality products. 'Spaghetti alle vongole', or 'spaghetti with clams', is one of those simple dishes that are very hard to get right because of their simplicity. It is also a good way to test a chef, reason why I elected this dish (besides the fact that I haven't eaten it since I moved to Singapore). It was superbly executed. The spaghetti were perfectly cooked, the vongole were juicy and the sauce was nice and thick, without that annoying butter that some restaurants feel the necessity to add. This dish must have no butter added to it. Finally and most importantly, that unique 'vongole' light 'sea' overtone fully penetrated the spaghetti. The 'halibut steak with caponata' consisted of a pan fried fillet of halibut with an extremely thin, crispy skin covered by a paste of black olives. A tasty 'caponata' accompanied the fillet. This is a Sicilian mix of chopped vegetables such as aubergines, celery and tomatoes with capers, seasoned by a sweet and sour sauce. The fillet was perfectly cooked and the combination was light and refreshing. I was pleased to have a meal at 'Via Condotti' once again. I was a bit nervous by the change of management, which can often spoil a restaurant's identity. If you are up for a centrally located, good quality, mid-priced Italian meal complemented by excellent service and calm, exclusive atmosphere, I would highly recommend Via Condotti. For those who know little about the history of Pizza, this Italian delicacy was born in Napoli (Naples). Almost 200 years later, the real, authentic Neapolitan pizza can still only be tasted in Napoli... with a few exceptions. Pizza metro makes one of the best Neapolitan pizzas you could possibly have, and it's located in London. Even if you went to Napoli, it would not be that easy to find a pizza of this quality, unless you went to one of the very few historical pizza restaurants left today. Pizza Metro has quite a history. It was actually the very first restaurant in London that made pizza using a real wood-fired oven. At the time, it was rather hard to obtain a license allowing a wood fired oven at any restaurant's premises. On top of that, while all other London restaurants only made your standard average pizza, Pizza Metro was the first to offer real Neapolitan pizza. So many years later, Pizza Metro still offers the best pizza in London. You can only understand what's behind such art once you speak to Valentino, the pizza Chef. Someone who dedicated his whole life to pizza, for whom pizza is an art and passion. He can transform a lump of dough into a paper thin 2 meter long sheet effortlessy, in less than a minute. I asked him "what is the secret of proper Napolitan Pizza? Is it really a secret?". His response was "Pizza comes from the heart. If you are nervous, pizza will come out nervous. Making pizza cannot be taught. It must be observed day by day with interest and passion, until it will just flow naturally". While the dough is the hardest part to get right when making Neapolitan pizza (several considerations need to be made depending on the type of flour, water, temperature etc...), the next challenge is flattening it into such a thin sheet without making any holes. The oven is also key. Maintaining a constant temperature and cooking the pizza without burning it. It only takes 3 minutes to cook! The most traditional pizza is simply topped with Tomato sauce and basic condiments. Next, "Margherita" which also includes mozzarella cheese. The peculiarity of Neapolitan pizza is its length, It comes in measures from 0.5m (for 1 person) up to 2m (for up to 4-5 people). One long pizza can have several sections with different toppings (generally a different topping every 0.5m). I cannot comment on the taste of this pizza. Try for yourself. You won't have tried pizza until you have eaten this. The difference is just too big to be filled by words. We started with a Mozzarella di Bufala with cherry tomatoes. These are flown in directly from Campania a few times per week. It was as firm and juicy as it should be. We then had an unmissable 'Melanzane alla parmigiana' Neapolitan style. For those who never had this dish, it is a sort of 'lasagne' with no meat and no dough. Layers of fried aubergines are interleaved with layers of tomato and mozzarella, finally topped with Parmesan cheeese and baked in the oven. Any tomato lover will appreciate this dish. These Neapolitan meatballs also had that Neapolitan, mediterranean touch. They were so light and tasty you would just have a plate full of them, accompanied with Italian bread. This was my first time to have handmade fusilli. These 'Handmade fusilli with seafood' had that comfort 'home' taste you generally can't experience in a London restaurant. The handmade version is totally different from the industrial one, and I absolutely prefer it. I will definitely try to make these at home once back, as they will be missed. There was definitely mastery in the way ingredients were elegantly bound together by a light and yet yummy sauce. The same could be said for these 'Spaghetti con polpo e pomodoro', or spaghetti with octopus and tomato. The smooth and tick tomato sauce made with fresh tomato was well combined with tender slices of octopus tentacles. It's quite simple. If you are visiting London and you like real Italian food, then visiting this place is a must. 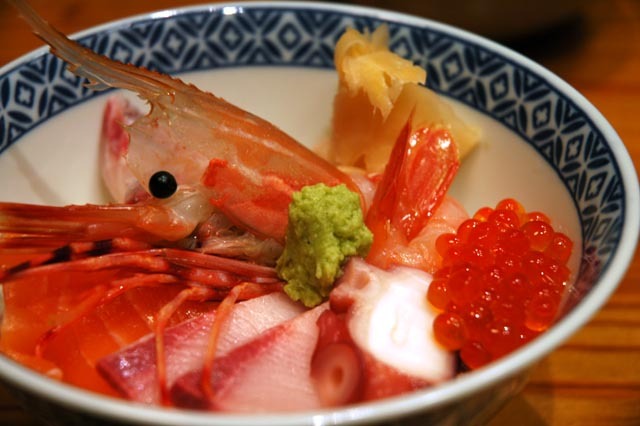 You will have the chance to have food that you can't get in Singapore and would be hard to find even in Italy. 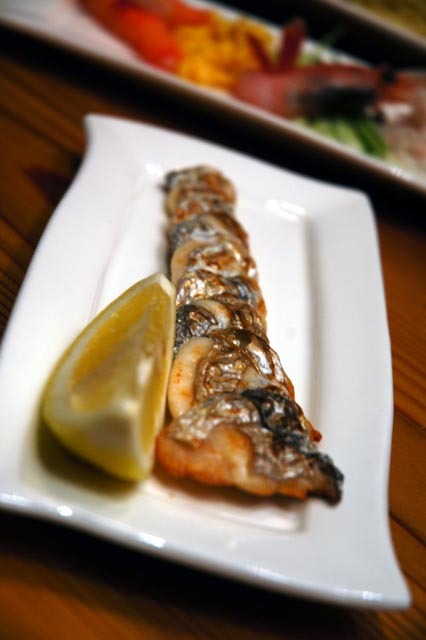 Remember to try their specialties such as pizza, starters, and especially 'Salsiccia e Friarielli'. Apologies for disappearing for so long. I have been on a business trip to London, where I had no access to a PC to comfortably blog about my latest culinary experiences. However, I have taken a small camera with me, which enabled me to take some interesting pictures that I am intending to publish, together with some information about relevant places I have visited. Cipriani falls into that category. For those few who haven't heard of Cipriani before, a little bit of History. Cipriani is probably the most renowned Italian restaurant worldwide. Inventor of Italian dishes like Carpaccio and Bellini, Giuseppe Cipriani opened the first branch in Venice (called Harry's Bar), which initiated the phenomenon that Cipriani became to date. Cipriani London is 'the place to be'. Regularly frequented by celebrities (for instance, the night I was there, Stevie Wonder was sitting at the next table), it is a place of luxury and opulence where the food served is as simple as it can be. You would expect a place of this rank to serve fine dining. 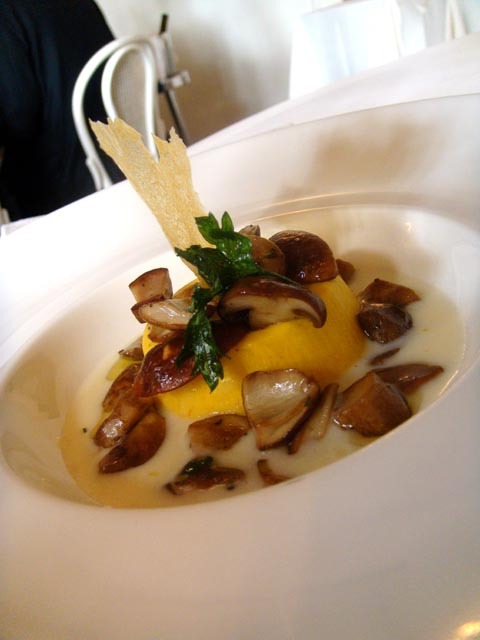 On the contrary, Cipriani mainly serves simple Italian classic and traditional dishes. Located in the heart of MayFair at a very discreet location, Cipriani is full every day of the week. 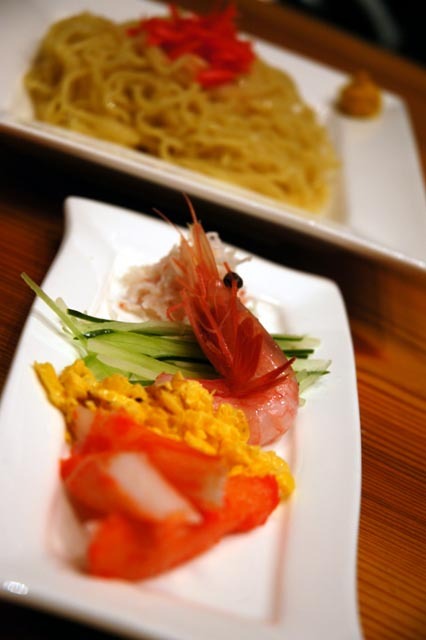 You will definitely have to queue up for a table and booking is strongly recommended. I was welcomed by a Bellini served right at the bar. It was without a doubt the best one I ever had. If you can't afford to splash so much cash for a meal at Cipriani, I would at least recommend it for a Bellini. They invented it, after all! We were lucky enough to sit at one of the best tables. The menu was extremely simple, just as your regular Italian restaurant, but complemented by an extremely buzzing environment, impeccable service and food. We started with a few 'antipasti'. The Zucchini fritti was to die for. These sort of 'zucchini chips' were so light you just couldn't stop tucking into them. The batter was light and they maintained their fragrance without releasing any oil. Needless to say, ther Parma ham was the real thing. Tender, sweet, sliced to perfection and well presented in a generous portion. The bread accompanying the ham was a rather unusual version as you can see. It was more like a croissant, shaped like a cone. Fluffy and fragrant, it was a perfect match for the ham, as opposed to the more traditional soft and crusty Italian bread. If you want to test how much care is put into selecting their raw products, having some fresh mozzarella is what you should do. The buffalo mozzarella with plum tomatoes was extremely good, although I have had competing ones at other venues in London. The thing to look for when having buffalo mozzarella is the milk inside it that should spring out as you cut through it. 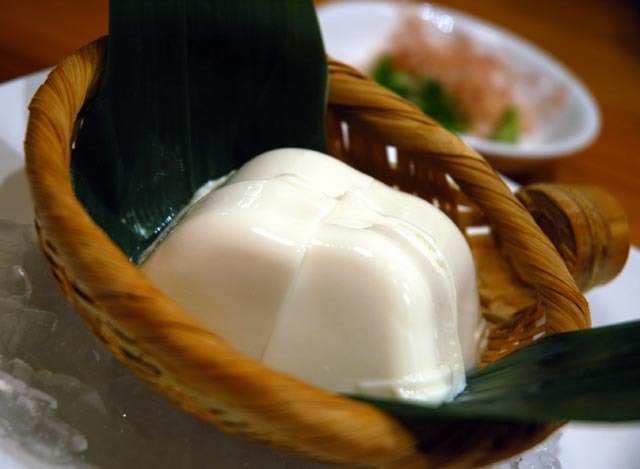 And then again, once in your mouth, it should release plenty of milky juice as you slowly chew it, while maintaining a firm texture (not a soggy one). The problem with buffalo mozzarella is that good quality ones are only produced in Italy and they must be eaten the same day. On the second or third day they just won't taste the same. Scampi Fritti is another Italian classic, particularly popular abroad. This was my favourite dish: so simple and yet surprising. These scampi were so tender and juicy you just didn't need to chew them. I would recommend anyone to try these at Cipriani. These 'Paccheri alla Genovese' were not what you would expect from a sauce from Genova, the hometown of Pesto. These huge pasta tubes are nice and firm ('al dente'), topped by a very savoury 'Genovese' sauce, composed of vegetables and meats braised long enough to make it smooth. Overall a fairly strong but interesting flavour. This cod with olives and tomatoes was again one more example of Cipriani's style. As you can see, they are not excessively formal when it comes to presentation. Instead, their priority is to deliver the traditional taste of real Italian dishes made with fresh, well selected ingredients. Besides its price, there's very little you can complain about a meal at Cipriani. That said, you know what you are paying for: simple, traditional food, and being at what is considered THE Italian restaurant chain worldwide.